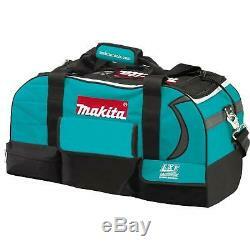 7-Tool Makita Cordless Combo Tools Kit Set Drilling Driving Fastening Cutting. The Makita 18-Volt LXT Lithium-Ion Cordless 7-Piece Combo Kit is built for the pro-user who demands a wide range of best-in-class cordless solutions. The XT706 delivers 7 Lithium-Ion cordless tools for drilling, driving, fastening, cutting, grinding, demolition, and more. The XT706 includes a 1/2 in. 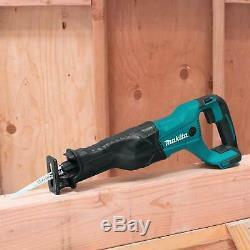 Hammer driver-drill with 480 in. 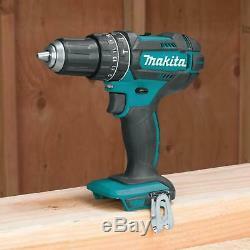 Of Max Torque, a powerful impact driver with a full 1,460 in. Of Max Torque, and a 6-1/2 in. 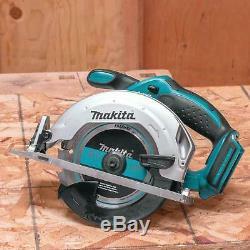 Circular saw that will cut 2X material at 45. The kit also includes a recipro saw with a refined crank mechanism that delivers faster blade speed and longer stroke length for more efficient cutting, and a 4-1/2 in. 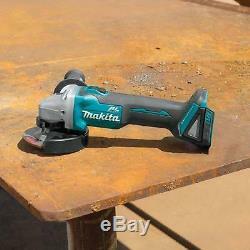 Angle grinder with an efficient brushless motor for corded grinding performance without the cord. Additional cordless solutions include a rechargeable flashlight with Xenon bulb. The XT706 includes two 18-Volt LXT Lithium-Ion 3.0Ah batteries, an efficient Rapid Optimum Charger, and tool bag. 7-tool set covers drilling, driving, fastening, cutting and more. 2 lithium-ion batteries and Rapid Optimum Charger included. Rapid optimum charger communicates with the battery's built-in chip throughout the charging process to optimize battery life by actively controlling current, voltage and temperature. Makita technology delivers category-leading charge time, so the battery spends more time working and less time sitting on the charger. Cut-off/ angle grinder delivers 8,500 RPM; features automatic speed change technology that adjusts speed and torque during operation for optimum performance. Circular saw delivers 3,700 RPM for faster cutting and ripping through wood and weighs only 7.3 lbs. 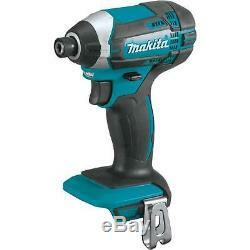 Hammer driver-drill (0-600 and 0-1,900 RPM) with Makita-built 4-pole motor delivers 480 in. Of max torque; weighs only 3.9 lbs. Equipped with star protection computer controls to protect against overloading, over-discharging and over-heating. 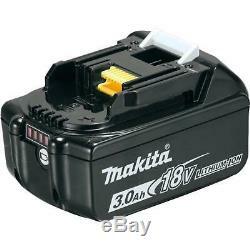 Only use genuine Makita batteries and chargers. 4-position flashlight with Xenon bulb runs up to 4 hours per charge. Variable speed impact driver (0-2,900 RPM and 0-3,500 IPM) provides 1,460 in. Of max torque for a wide range of fastening applications. Rapid optimum charger has a built-in fan to cool the battery for faster, more efficient charging. Recipro saw provides 0-2,800 SPM and features tool less blade change; weighs only 8.3 lbs. 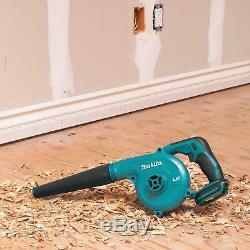 Variable speed blower (0-18,000 RPM) for optimum speed control. Product Details Battery Power Type: Lithium Ion Charger Included: Charger Included Color Family: Teal Condition: New Cordless Tool Type: Combo Kit Cordless/ Corded: Cordless Motor Type: Brushed Number of Batteries Included: 2 Number of Tools Included: 7 Power Tool Features: Bag Included, Keyless Chuck, LED Light Tools Included: Angle Grinder, Blower, Circular Saw, Hammer Driver Drill, Impact Driver, Reciprocating Saw, Worklight Tools Product Type: Power Tool Voltage (v): 18v. For Electrical Items: All our electrical products are manufactured according to the specifications of the US Electrical Standards and codes for use in the US using a 110-120 Volt power source. We assume no responsibility or liability if the item malfunctions or causes an accident because you tried to use the product with foreign electrical standards. The use of these items with a converter or other voltage transformer is at your own risk. 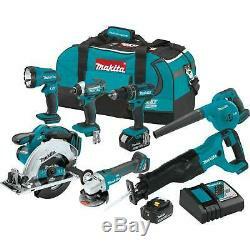 The item "7-Tool Makita Cordless Combo Tools Kit Set Drilling Driving Fastening Cutting" is in sale since Saturday, January 12, 2019. 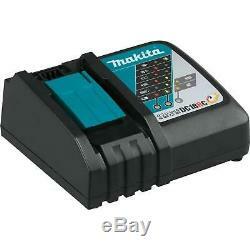 This item is in the category "Home & Garden\Tools & Workshop Equipment\Power Tools\Power Tool Sets". The seller is "absolutequality247" and is located in Corona, California. This item can be shipped to United States, Canada, United Kingdom, Denmark, Romania, Slovakia, Bulgaria, Czech republic, Finland, Hungary, Latvia, Lithuania, Malta, Estonia, Australia, Greece, Portugal, Cyprus, Slovenia, Japan, China, Sweden, South Korea, Indonesia, Taiwan, South africa, Thailand, Belgium, France, Hong Kong, Ireland, Netherlands, Poland, Spain, Italy, Germany, Austria, Bahamas, Israel, Mexico, New Zealand, Singapore, Switzerland, Norway, Saudi arabia, Ukraine, United arab emirates, Qatar, Kuwait, Bahrain, Croatia, Malaysia, Chile, Colombia, Costa rica, Panama, Trinidad and tobago, Guatemala, Honduras, Jamaica, Viet nam, Uruguay.